Along comes a little surprise one day, that at the time, doesn't seem like that big of a deal. Then later, like the next day in this situation, you realize that what previously seemed like no big deal should actually go on Winelala's Everyday Gem list. 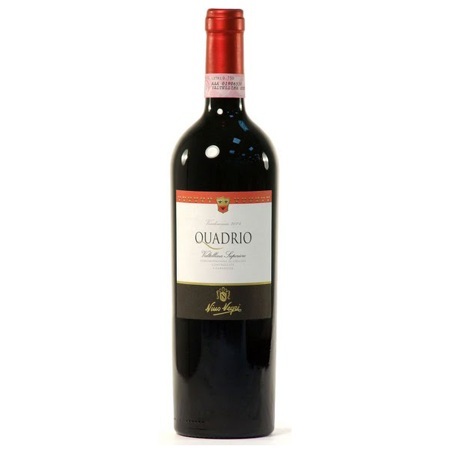 Nino Negri's Quadrio was just that wine. I wish I could take credit for this one, but my friend and mentor Marco Avigo brought me the bottle, cheerfully, as an example of a fresh and juicy, casual, every day 90% Chiavannasca (Nebbiolo) - 10% Merlot blend. The purpose of sampling the wine was to highlight the aging and production differences between it and three other more layered and intense wines. The Quadrio lived up to Marco's introduction. Light, easy, full flavored, but not necessarily full bodied or long lasting, it was all red berries, violets, plum jam, and vanilla bean. Great for apps and chatting. Not everything has to be a complex powerhouse. I brought the half bottle that remained to a friend the next day for a super casual chat, and poured it without much thought to the previous day's notes and was suprised to fine that overnight, the wine had transformed into something truly lovely. The flavors had deepened and melded. The red berries extended into chocolate covered cherries and cola. It was still easy and light, but what a sensation. Buy this when you can. Taste it, let it sit and breathe, and then taste it again. It stays good and only gets better! !